This window is for adding a new Scheduler Task. It is presented when the user presses the 'Add' button in the Scheduler View. Enter a descriptive name for this task. This name is used for display purposes only. Tasks can be run once at a specific date and time, daily, or on a weekly cycle on selected days of the week. 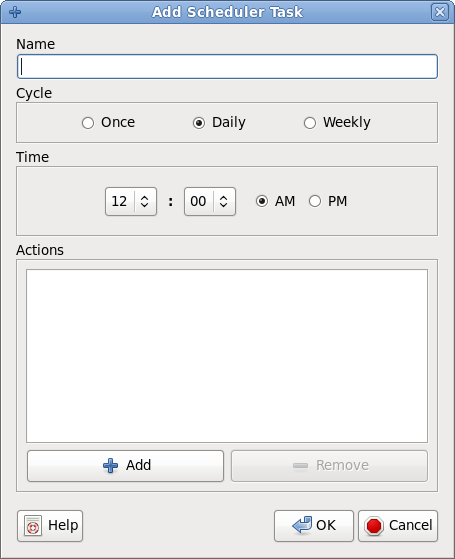 Select the time of day, days of week, and/or specific date for the task to run. This area will display what actions will be taken when the task is run. The 'Add' button will present a menu where Transfers, Downloads, Seeds, RSS Feeds, and DHT can be stopped or started by adding them. Bandwidth throttles can be set. The Auto Limit can be turned on or off and set. Bandwidth presets can be applied. Shutdown options and 'from other tasks' options are available to add. If an action is selected and the remove button is pressed that action will be removed.